Most people fly into Leon International airport. From there you can take a shuttle, about 1 hour easy ride, to San Miguel de Allende. Our workshop participants have used www.bajiogo.com for transportation needed and they told how happy they were with their 24/7 service. Another airport option is by flying into Mexico City, from there you'll also need to take a shuttle or a luxury bus Primera Plus. The ride is about 4 to 5 hours to San Miguel de Allende. We love this way to travel in Mexico. The buses are very comfortable, have AC, movies, bathrooms, snack or lunch, and some have personal computers with movies, games, and of course access to the internet for each passenger. 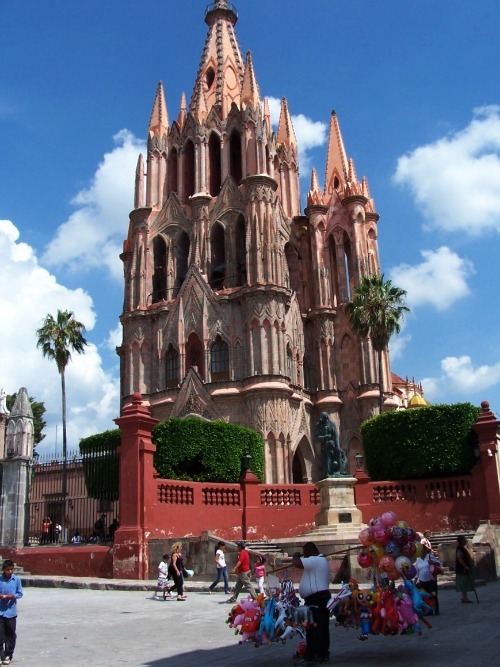 San Miguel de Allende is a touristic center. Fortunately there are no problems, and people walk around enjoying the town until late at night. You will see the Police on foot or on 4 wheeler or horses, day and night. They are here for your safety. We recommend that you use your common sense, just as you would at home. they are not reasonable you your forgotten items. Temperature varies between 50-85 F. The weather is spectacular mostly sunny, July to September we experience showers on and off. All year around bring a sun hat, sun glasses and walking shoes! It is lots to see and enjoy! Bring your prescription with you or extra dosage. At time people lose it or decide to stay extra time, and this way you can continue your treatment. Cafe Zenteno, Calle Codo and Hernandez Macias, behind the fountain! Best coffee in San Miguel! Just make sure that you check San Miguel map available on www.googlemaps.com if it is your first visit to San Miguel de Allende, your accommodations are no farther then 5 blocks form the Main Plaza.WHY?At time people would advertise things such as: "An easy 10 min. walk to center", when in fact there are 10 min. easy ride in a taxi. 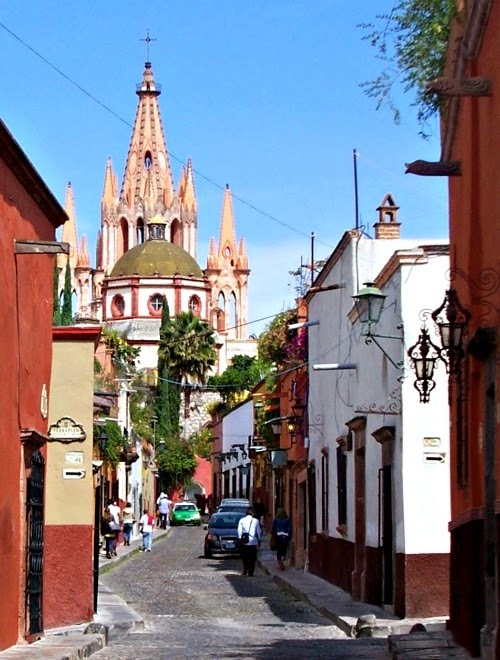 San Miguel de Allende is a bountiful, quaint, friendly city! We are confident you will enjoy your stay any time of the year! Most of us here take taxis as an easy and comfortable way of transportation. 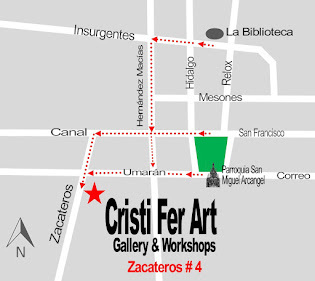 Within Centro area the taxi fair is 40-50 pesos. No tip needed, since taking a taxi is not a luxury but a necessity used by locals and tourists alike. Most taxi driver do not speak English, many do not read or write in Spanish ether. When a taxi takes you somewhere it is customary to give the cross street. 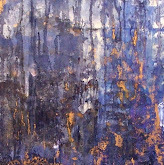 Such as: Zacateros Y Umaran. Buses cost 7 pesos, and they are marked in the front with their main destinations. Such as Centro, MEGA, Sorians. Cars. It's difficult to find parking in Centro. There are several parking lots, I do not know the cost of parking since we never had a car in 15 years living in Mexico. One parking lot is on Ancha de San Antonio and Codo. Another on Insurgentes and Hidalgo. Just take a taxi, it will cost 50 pesos, and just give the driver the name of the store. To return you can pick up a taxi by the main entrance of the store. It is customary to tip the person who bags the groceries and the person who will help you load them in the taxi. We tip 5 to 10 pesos according to the amount of groceries. If the taxi driver helps us to bring the groceries inside we tip another 20 pesos.